Help put the baby to sleep or relax after a long day or on the weekends in the comfort of our Amish Glider. 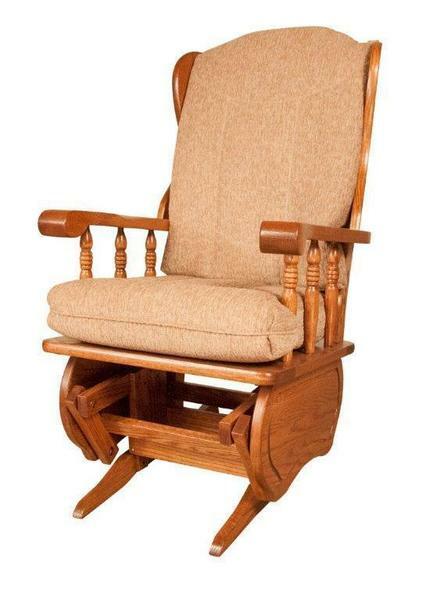 This traditional-style glider is built with a solid wood frame using Old World techniques that make this lounge chair built to last and an heirloom -- imagine your children's children being glided to sleep in this chair with high back, cushioned seat, scroll arms, and turned arm supports. Customize this relaxing treat by having it made in your choice of wood, finish, and upholstery from a variety of options. I wanted to let you know that my son's oak glider rocker arrived this month probably on Feb. 13th as he lives at Fircrest Center and I was not there when it arrived. I saw it for the first time on February 18th. It is absolutely beautiful and a work of art. I wish I knew the name of the person who built my son's glider rocker so I could write him/her a personal thank you...any chance that is provided? It should last him the rest of his life.The work order was 94343. Was this rocker made in Ohio by the Amish or in Pennsylvania by the Amish? Again, my deepest appreciation for such beautiful work by a wonderful craftsman that my son will enjoy for years to come. Thank you ever so much for facilitating the creating, building, and arranging the delivery of this beautiful handmade glider rocker.